Leaving our Native American heritage for a moment, I am going to pick up with Mary Elizabeth Duncan Young, in honor of St. Patrick’s Day. She is otherwise known as Grandma Young, according to Great Uncle Brian. When I was twelve, we (me and Jackie, just for clarity’s sake, although whenever I say we it is always me and Jackie!) traveled to Alabama with Momma and Daddy. We were on a trip to Florida to visit my Aunt Fran and Uncle Don. Not relatives, but an Aunt and Uncle just the same. We stopped in Alabama to spend the night. My mother had the very Irish appearance of red hair, bright blue eyes and freckles. She also had alabaster skin and no Native American blood seemed to have touched her. Her Irish blood came through loud and clear. On this trip, we stayed with Uncle Brian and Aunt Lilly. Uncle Brian took us to meet his brother, Uncle Tom, but before that, we made a trip to the cemetery. My father would make driving through a cemetery fun. We would read the headstones as we went and I would think about the people who were buried there, what their lives were like, who they were and how you could encapsulate a lifetime in a few words on a stone. No wonder I grew up to appreciate a good cemetery trip the way I do. Anyway, while we were in Alabama we stopped at the cemetery to visit Grandma Young. She was born June 30, 1843 in Bacon Level, Alabama. According to her Civil War Pension record her father’s name was spelled John S. Dunkin. She was married to George Washington Young (he was called G.W. and it must have been a popular name during that time) and by the time the Civil War rolls around, she was married and a mother. 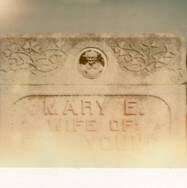 Her husband served in the Civil War in Georgia. She went on to raise 7 children over a span of 15 years. When I got my results back from my DNA test, I had almost 400 matches to sift through. I found a match for three people who are matches to each other and to myself. The best family line that seems to match all four of us is the Duncan (Dunkin) line. John S. Duncan (Dunkin) is the son of a Peter and Margaret Dunkin. They moved from South Carolina to Coweta, GA between 1812 and 1828 and (pausing here for dramatic effect…) John S. Duncan won land in the Cherokee Land Lottery. In the 1870 Census, John S. Dunkin is listed as a wagon maker and working with Reason Mobley, brother of his wife, Lucretia Duncan. Now, where was Benjamin Marshall from? Coweta, Georgia, you say? Always the damn Indians! So, one side of my heritage prospered from the other side’s misery. John S. Dunkin married Elizabeth Mobley in 1825 and in the 1832 Cherokee Land Lottery, he was the winner. The poor Marshall family was not the winner. Back in Alabama to finish the cemetery story, my dad saw a man climb into a pick up truck and drive away from the cemetery as we arrived. 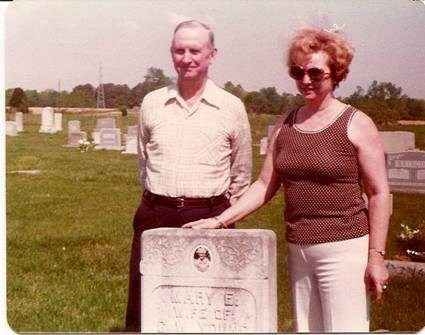 After we visited the graves and Grandma Young, Uncle Brian took us to visit Uncle Tom. As soon as we pulled up to Uncle Tom’s house my dad said he had just seen that pick up leave the cemetery as we arrived and didn’t know it was Uncle Tom. So Grandma Young was as big a draw at the cemetery as she was in life. The youngest child standing on the left in front is my Aunt Kay, then Grandma Lula Hardin and next to her is Grandma Young. 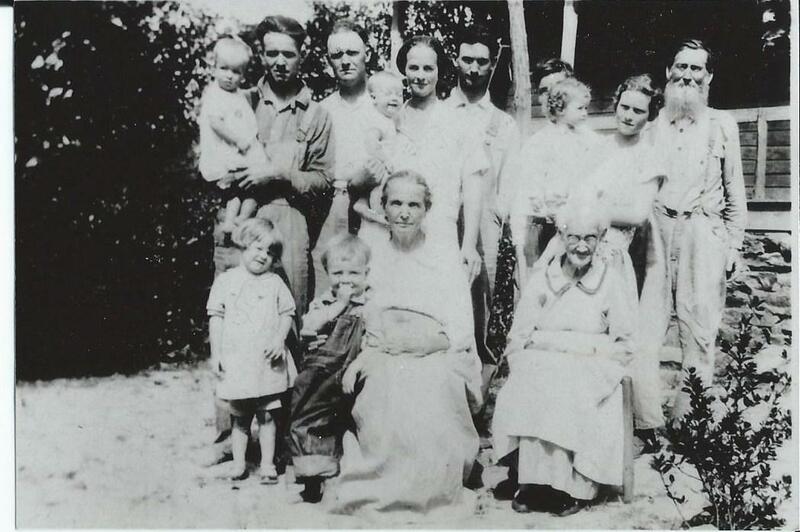 The first man on the left, holding the small child is Great Uncle Tom, then my Grandpa Hardin, then next is Great Uncle Brian’s first wife, Marnie holding my Aunt Jean, then my Great Uncle Brian and at the end of the standing row is Alfred Hardin. When I look at Grandma Lula (Mary’s daughter), I picture my mother’s face. So when I look at Mary’s picture, I can see her with red hair and bright blue eyes. See, Hailey, our Irish heritage is right there, on the tree, between the leaves, plain for everyone to see. My momma favored her Grandma Lula and Grandma Lula looked just like Mary Elizabeth Dunkin Young. All funds will help procure ancestry research documents/information and travel. Walking in the steps of our ancestors to bring their stories to life.